Pick Up Sticks Overview: Before there were video games, kids used to throw piles of sticks on the ground and pick them up for fun. No, really, read the Pick Up Sticks rules that follow if you don’t believe me. Pick Up Sticks Rules: Player one begins the game by holding all of the sticks in their hand and then dropping them to the ground, scattering them across the floor. The player then proceeds to pick up the sticks, one by one, without moving any sticks other than the stick they are attempting to pick up. If any of the other sticks are moved, the players turn ends, and play continues to the left. The next player may choose to pick up a stick from the scattered sticks or scoop up all of the sticks and drop them again prior to attempting to pick them up. Players continue picking up sticks until their turn ends, and if a player picks up all the sticks, they retoss them and continue the process until their turn ends. Make sure to keep track of your score before tossing the sticks. 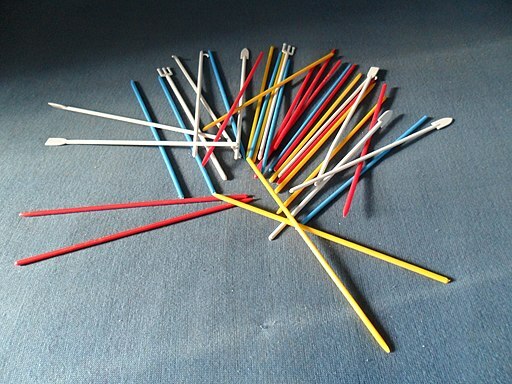 According to the Pick Up Sticks rules, if a player successfully picks up the black stick, known as the “Master Stick,” the player may use the “Master Stick” to move the sticks around in the playing area, separating sticks that are close together and isolating sticks so they are easier to pick up. No other stick can be used in this way. The game ends when a player reaches the agreed upon end-score. Starting at 500 to 1000 points is standard. Note: If a player picks up a red, blue, and green stick in that order, their points are doubled for those three sticks.